For the last couple years I've been a pretty diehard Wunderlist user. 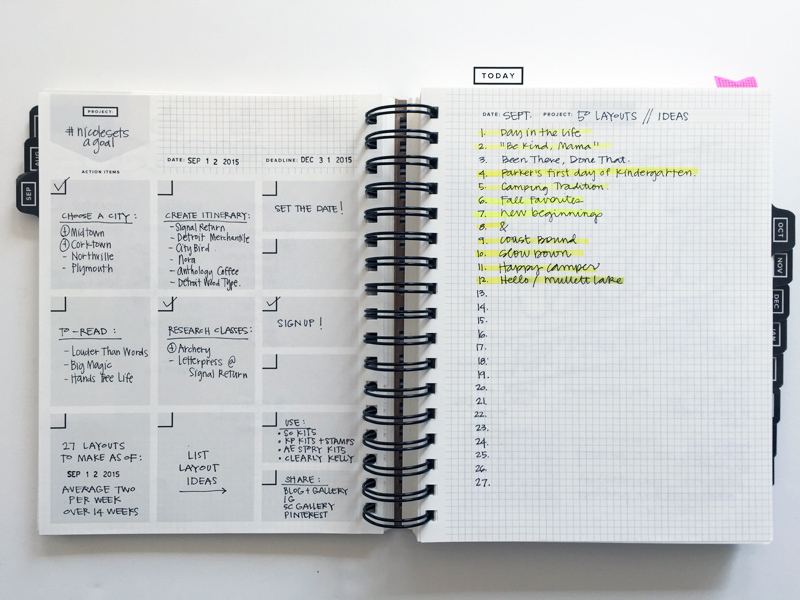 It's by far my favorite to-do list app, but I found myself still using notebooks and sticky notes for random lists and project planning. I even tried my hand at bullet journaling, which is also cool and enjoyed that for a bit, but I still wasn't completely happy with my system. When Elise announced the release of her Get To Work Book in March, I pre-ordered it immediately. Like within the first hour. It was easy on the eyes (hooray for black + white! ), yet very well designed. It was spiral bound and had several features that gave me some structure, but that I could still customize to my needs. I'm pretty sure I watched her walk-through video a dozen times, just to be sure. 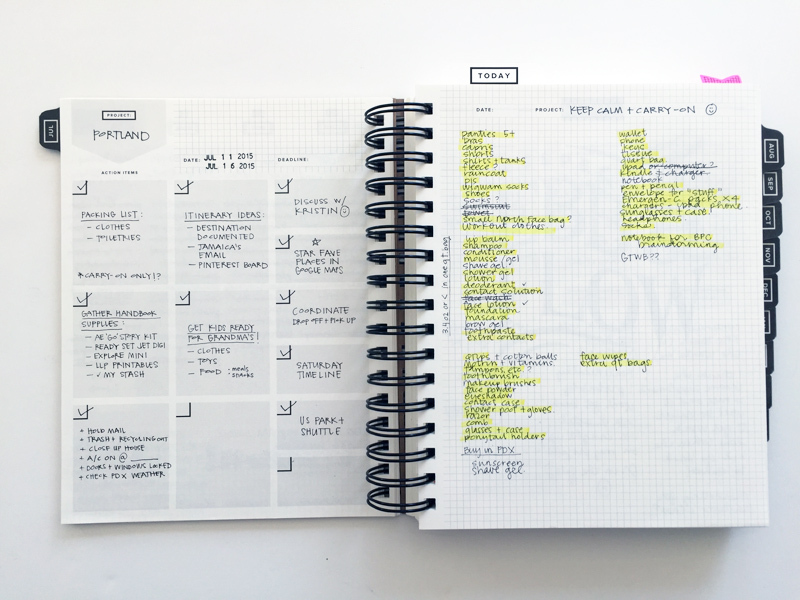 I wanted a planner that I could use for every aspect of my life - not just work or just home. I am a stay-at-home mom. I run an Etsy shop. I co-lead our Brownie troop. I scrapbook, design and teach for others. I volunteer at my kids school. I love my "jobs" + I love to set goals and break down projects. If I bought a planner, it had to be my "everything" planner. And that is exactly what my Get To Work Book has become. Today I want to share my planning routine and how I've been using my GTWB over the last three months. MONTHLY PLANNING : Some time during the last week of the month, I like to start planning the following month. The first thing I do is refer to a list I keep in the back pocket of my GTWB of recurring tasks that I do every month. This list includes things like testing our smoke detectors, backing up my computer and checking the balance on the kids lunch accounts. It may be a little excessive for some but I write everything down - even the simplest reminder. I just do these things once a month and for the most part, it doesn't matter what day. I just spread them out. Next, I look at my iPhone Calendar / iCal and write in any meetings, appointments or deadlines in the GTWB calendar page for that month. Above you can see what my calendar from September looked like. By default, I record any timed event, or anything involving the kids school schedule, in my phone first because I set alerts for reminders, and I like that Mark and I can share a calendar so we can see what the other has planned. I jot any noteworthy events into the GTWB calendar as well as on the corresponding day in the weekly spreads. I'll get more into those later, but I usually designate the first three spots for each day for appointments, etc. Lately I've been decorating my calendars with stamps too. I love Kelly Purkey's Clearly Kelly Planner stamps. people - Mark, the kids and school, our parents and siblings, friends and all of the things I do with them go here. physical - doctor / dentist appointments, exercising, and other habits + goals like getting more sleep and drinking more water go here. personal - examples include updating next season's wardrobe, reading a particular book or making adjustments to my routine. household - decorating, organizing, yard work, finances and the like go in this category. work - basically, anything that generates income. creative - scrapbooking projects, painting, sewing - if it's a craft or hobby, it goes here. I've written these six categories on post-it flags and stuck them to the tabbed page at the beginning of each month in my GTWB - giving myself room below each to add notes. Then, I just start plugging in tasks + goals to each of these categories. On most months, my main focus is on one or two categories. Ideally, that's how I want it to be so I'm not overwhelmed or beating myself up because I'm not getting enough done. I learned that the hard way this past summer. I've learned that a little pre-planning really helps me to not overcommit myself like that again. For example, with Thanksgiving and Christmas approaching, the holidays are going to have a heavy focus on people and household. I'm not going to give myself too many expectations with getting any new work or creative projects done during that time. Knowing what my focus is also helps me know what my 3 big action items will be each week. Again, I'll cover that in my weekly planning routine next. You could make a list like this at any time but creating new priorities each month is what is working for me. While I only create a Priorities page one month at a time, I do keep a large sticky note on each month's calendar to jot down ideas that come to me for future months, like signing Morgan and Mark up for the Daddy / Daughter Dance in January, making spring break plans in March, and preparing for the kids birthdays in May. Once that month comes along, I will make a nicer, more "formal" list then. Back the the monthly planning - if there are any simple one-step tasks I can schedule into the month, I do that now within the weekly spreads. Otherwise, I hold off until I begin weekly planning to start breaking down those goals. As a reference, I spend about 30-45 minutes doing this monthly planning. WEEKLY PLANNING : Each Sunday I plan the next week, which like the monthly planning, involves a few steps. First, I make sure all of the timed events + deadlines in my Calendar are still accurate and noted at the top of each day in the weekly spreads. This gives me a good overview of the week as I can see when I'll be out of the house or when I need to finalize a project that's due. Along with the monthly recurring tasks list I keep in the back pocket, I also have a weekly recurring tasks list. I refer to that next and jot in my routine in the corresponding days. This includes things like cleaning the house, collecting our trash + recycling for garbage day, running three times a week, meal planning + writing a grocery list, planning Project Life spreads and printing photos, plus reminders for the kids like when their homework is due and returning books on their media center day at school. While 95% of this is probably habit by now, I still write it down. I write everything down. Next, I look at my Priorities page on that month's tab. Some of these items are easy and some I need to breakdown into steps and that's where the Project Planner pages come in. I'll go over those in a bit. I try to pick and choose a few tasks I can handle for that week and that's usually where I write in my action items in the left column of the weekly spread. There are three squares and I usually use at least two, if not all three. Sometimes it's general and other times it's more specific, but I just write in whatever I need to focus on and get done that week. At this time, I also review the dinners I have planned for the week. If I need to take chicken out of the freezer the night before we have enchiladas, or prep soup in the crockpot before lunch, I write those in now. Overall, I spend about 20-30 minutes on Sunday planning out the week ahead. DAILY PLANNING : Each day during breakfast, I like to review my plans for the day. As I mentioned earlier, I reserve the top three spaces for timed events because those are must-do's. I also save that space for recording Mark's schedule - if he has a late meeting or will be out of town for work, I write it there. I've also been experimenting with writing in my scheduled blog post title for that day as a reminder to mention it on social media. As the days go on, I write in a variety of different reminders and tasks that fill up my week. No to-do is too small for my GTWB! As I get things done, I simply cross it out in pen. I use the gridded note section in the bottom left corner to note deliveries I'm expecting that week. I use the bottom right corner to keep track of things I want to do the following week. I've also used that space to jot down notes for blog posts, especially when I'm due to write a "currently" post and collect prompts to include throughout the week. At the end of each day, whatever I didn't get done, I highlight in yellow. I don't re-write it on the next day. A quick glance tells me what didn't get done when I see those yellow marks. Typically, if something didn't get done, it wasn't that important in the first place, or I over-scheduled myself. If/when I do get to it, I just cross it off in pen. If by Sunday I'm still procrastinating on that task, I either transfer it to the following week or I let it go. It's been interesting to look back at those yellow highlighted tasks and see what's carried over to the following week, and what hasn't. 95% of the time, my GTWB is home with me. Occasionally I'll have a meeting to go to and use it to keep notes, but for the most part, it lives either on my kitchen counter or my desk, open to the current week. The thickness and weight of the planner doesn't bother me at all, but I also don't take it anywhere other than room to room. If I write a shopping or errand list in it, I usually just take a picture of the list with my phone before I leave home for reference. And since I flip back and forth between the calendars and planning pages almost daily, I got the snap-in plastic bookmark too. It's sturdy and clear and you can't beat the price. I've planned a trip to Portland, prepared a new class at Big Picture Classes, created a plan to complete my 2015 goals and organized a whole-house purge. They are all very different, but the project planner helps me see the big picture + is versatile enough to break down those larger jobs into bite-sized, doable chunks. Whatever my big project is each month, I review this planning page when I'm planning my week so I stay on track. Doing a few tasks each week is so much better then cramming in a page long list two days before a deadline - real or self-imposed. REFLECT + GOAL SET : I love the idea of looking back at the month and reviewing what went well + what didn't. The very last page each month is a Reflect + Goal Set worksheet to do just that. It's pretty straightforward and I typically spend 10 minutes at the end of each month filling mine out. I particularly like writing in my wins and what to let go of. I make sure I carry over whatever I write in "to work on" and "to complete" to the following month. I also like flipping back to read my past "to think on" notes to see if they've been resolved. MY FAVORITE PENS : I prefer a thin-tipped black pen in my GTWB so I can write fairly small and utilize all of those lines. These are my go-to pens right now that have given me minimal to zero bleed through on the pages. I picked up the Staedtlers last week and those are my current fave. Phew, and that's it! With three+ months of daily Get To Work Book use under my belt, I can say I love this planner. It's totally working for me, helping me stay on task with all of the little + big things that are going on here. If I missed a detail that you are curious about, let me know! You can learn more about the Get To Work Book here. This post is completely unsponsored + was written with my own thoughts and experience with the planner. I'm just a happy customer who wanted to share how I'm using it to get things done.